The year was 1960, I had just left school with my “O”Levels and landed a job at the local freelance news firm, McConnell News Service, in Addison Chambers, Walgate, Wigan. At sixteen years old, I was the junior photographer. In my first week I arrived at work a little early one morning to find the partners and reporters sitting round discussing the calls from the day before. I heard my name mentioned and up went my ears. I had just been assigned to go out on the job that no one else wanted. J. Lawrence Isherwood, a publicity seeking artist had phoned in to say he had just completed his rendition of “Lady Chatterly’s Lover”, D. H. Lawrence’s extremely controversial novel of the day. Of course all the seasoned reporters and photographers were convinced that nothing would come of the job and saw it as an experience building opportunity for me. At sixteen and too young for a driver’s license I took a bus up Wigan Lane to the Infirmary, Jimmy Isherwood and his mother Lil lived in the end house just across the street. Let me just clarify one point here, he was known to the art world, the general public and the media people as J. Lawrence Isherwood, but to his mother Lily, his brother Gordon (and his family), ex wife Pat and yours truly his name was Jimmy. The day we met was the start of a lifelong friendship, but a bit of a challenge at the beginning, the house had paintings, paintings and even more paintings from floor to ceiling everywhere. Lil invited me in to their sitting room at the back of the house and there was the picture of Lady C on Jimmy’s work easel. As we chatted I was quietly trying to figure out how I could make this appeal to a news/picture editor so that it would appear in print. The painting was an impressionist image of a couple on a bed and the juicy parts were to say the least, a very vague blur of skillful painting that wouldn’t even appeal to the provincial evening papers. In a flash of inspiration I decided to have Jimmy tuck the 20″ x 16″ painting under his left arm, and pretend to be sneaking it across the way to a van. So there was the crouched artist by the back doors of a van, right arm reaching to open the doors, left sleeve conveniently obscuring the middle of the painting, with just the couple’s heads protruding, Jimmy was surreptitiously glancing over his left shoulder because of the controversial nature of the Lady C story and I caught what turned out to be the image that defined and launched his career. This was much bigger than anyone at the time could have imagined, my picture made it across four columns in The News of The World, it was hard to imagine, my first big hit at the age of 16, Isherwood was now so famous an hotel in Southport named a suite after him, he spent several months in Spain working on assignments and his work was selling for real money, no longer being traded for groceries. I bumped into his brother, Gordon, whose shoe store was on the street level below our offices, while on my way into work one day, Gordon couldn’t thank me enough for launching “Our Jimmy” and insisted that as long as I had feet, I would never pay for a pair of shoes again, actually as a teenager I did shop at his store, so true to his word Gordon took very good care of me during those years. On his return from Spain we went on meeting, Lily, Jimmy and I, at the Cherry Gardens on Wigan Lane, sadly the success and the money had lead to problems all of their own, the marriage to Pat was very short lived and my friend had started drinking rather heavily. I remember visiting him at Billinge Hospital where he had been admitted for some supervised R & R.
Flat broke and wanting to mount a come back exhibition of his work, I lent him a handful of 20 x 16″ frames to display the work in, well the exhibition paid off and he sold his work…. in the frames…. Not to worry he promised that I could help myself to as many paintings as I wanted to cover the cost. Now bear in mind some of this man’s work was outstanding, depending on when it was painted. 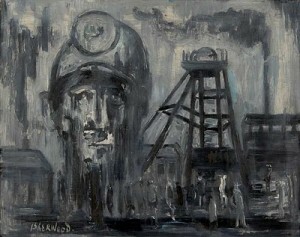 I only took one, for sentimental reasons, a ghostly depiction the early 1900′s Maypole Pit Disaster in Wigan and it was painted at the time Jimmy was living on a liquid diet, so while the painting is all black and grey, there is one uncharacteristic blob of pale blue, right where it shouldn’t be. Although I said uncharacteristic, blue was always one of Jimmy’s favourite colours. However that, for me, defined the time it was painted and while Isherwood paintings are currently fetching any where between two and ten thousand dollars apiece, for me mine is priceless.